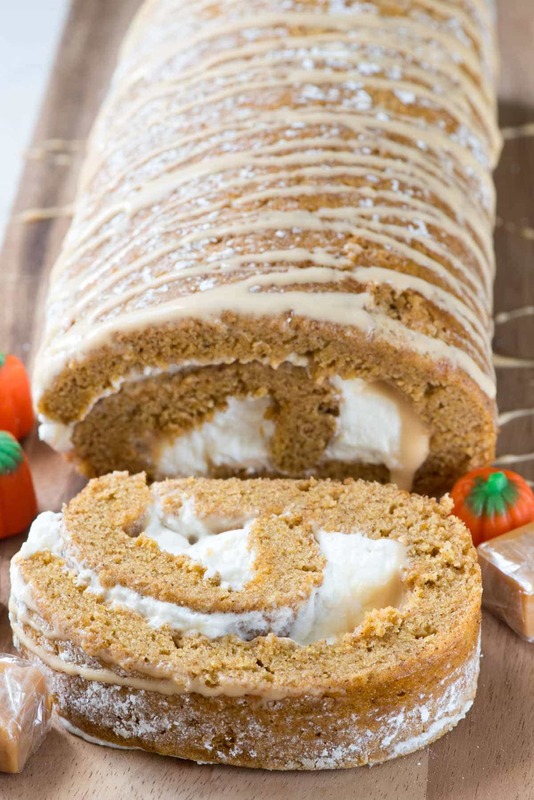 Caramel Pumpkin Cake Roll – an easy pumpkin roll cake filled with caramel ganache and cream cheese whipped cream. This is the BEST pumpkin roll recipe! 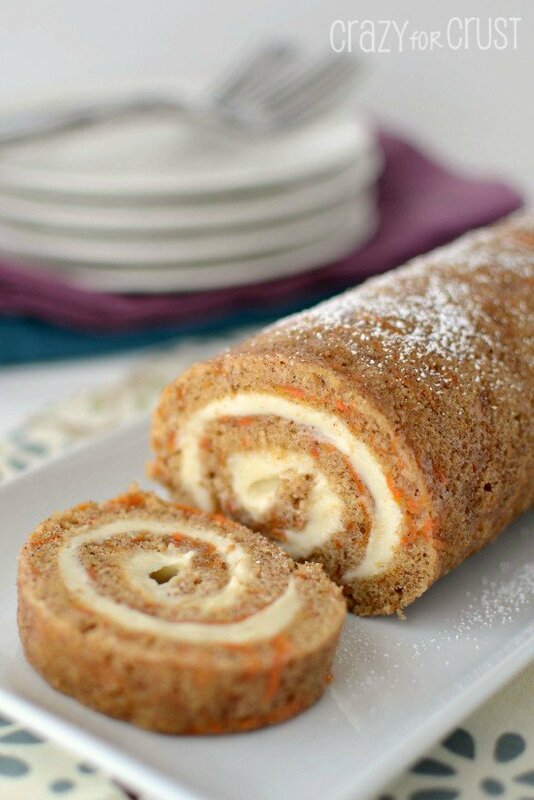 This pumpkin cake roll recipe is famous in our family. Well, sort of. You see, my mother-in-law has been making pumpkin rolls at the holidays for longer than I’ve known her. The cake part of this recipe is hers; the rest of it is my way of taking something everyone loves and messing with it to make it better (or, to some purists, ruin it). The first time I ever tasted a pumpkin roll was the first time I spent a holiday with Lorna, my mother-in-law. She used to make them every season and give them as gifts, but she was kind of a genius about it: she made mini pumpkin rolls. Instead of rolling it as one big one, she’d cut the hot cake into thirds and roll up three of them which, it turns out, is the perfect size for giving. Not only had I never had a pumpkin roll before I tasted hers, but I’d never had a cake roll in general. I ate that first cake roll in awe. Mel doesn’t like pumpkin (I know, right?) 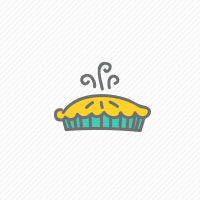 so I ate the whole thing myself, wondering about the magic of how you make them. Lorna explained it all to me, about the rolling in the kitchen towel, the powdered sugar, how cracks can be fixed with more frosting. It was years before I tried making my own cake roll; I was always so scared to try. And then I went for it and made one for my mom’s birthday one year. Then I made a carrot cake version…and after that I couldn’t stop myself. Cake Roll recipes became my obsession, with me making a new version every few months. I even have a draft of a cookbook proposal for a cake roll book (that I’ve never done anything with). 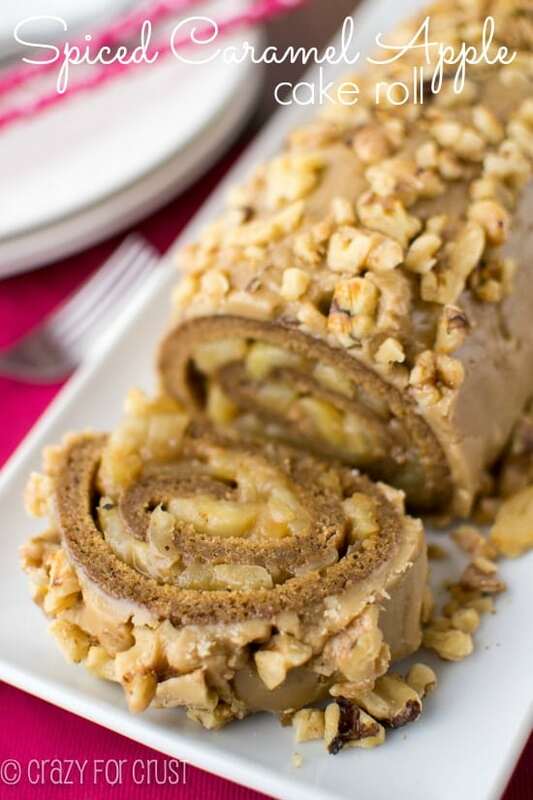 All of it started with THIS caramel pumpkin cake roll recipe and my sweet mother-in-law. I owe her a lot! I’ve only ever made Lorna’s recipe once before, and I used her traditional cream cheese filling. I love the original, but you know me: I’m a tinkerer. Plus, there are a million and one pumpkin cake roll recipes out there and I wanted one that was a wee bit different. SO…that said, THIS is your new favorite pumpkin cake roll recipe. The recipe is a basic pumpkin roll cake. I’m not sure where it originated, but after some Googling, it looks curiously similar to the one on the Libby’s Pumpkin can. 🙂 That said, the cake is easy to make, perfectly pumpkin-y, and perfectly spiced. If you’ve never made a cake roll before, don’t worry. It’s EASY. I’ll include some tricks and tips below, and you can check out this post for a video. The difference between this recipe and all the other basic pumpkin cake roll recipes out there? THE FILLINGS. Yes, fillings plural; there are TWO! First, I coated the cake with a generous helping of caramel ganache. Oh, you’ve never heard of caramel ganache? It’s something I “invented” several years ago as a filling for a banana cake. You melt Kraft caramels with heavy whipping cream, let it chill until it’s a soft-solid, then you whip it with a hand mixer. The result is a creamy spreadable caramel that’s the perfect cake or cupcake filling. Instead of a traditional cream cheese frosting, I used my favorite cream cheese whipped cream. It’s been one of my favorite frostings, ever since I made my Strawberry Shortcake Cake Roll last spring. It’s easy to make, whipped and fluffy, and the perfect filling for the spicy pumpkin cake. Think making a cake roll is too hard? It’s not, I promise. First of all, you need the right pan. Get yourself a jelly roll pan, which is a 10×15 inch pan. The recipe tells you to beat your eggs for a long time. I know it’s annoying and you’ll be tempted to stop after 30 seconds. DON’T. Beat them the full time, the longer you beat your eggs, the fluffier your cake will be. The cake will be a thin layer in your pan, that’s okay. Just make sure it gets into all the corners. And do yourself a favor, line the pan with foil and spray it heavily with nonstick cooking spray. It makes it much easier to get out of the pan. Speaking of getting the cake out of the pan, do it while it’s HOT. While the cake is baking, lay out a clean kitchen towel and coat it with powdered sugar. The more you use the less likely it will stick…I tend to use a lot. It gets everywhere. It’s okay, the cake is worth the cleanup. ROLL IT WHILE IT’S HOT. Come on, sing it with me: roll it while it’s hot, roll it while it’s hot…then let it cool completely. Don’t worry if it cracks. Mine did, but you can’t even tell. Glue it together with the filling. If it cracks on top, give it a decorative frosting with the whipped cream on top. Cracking can happen for so many reasons (not cooked enough, cooked too much, it’s humid out, it’s dry, your kitchen is messy, McDreamy died on Grey’s Anatomy…etc.) so don’t let it get you down. Paste it back together and move on. Chill the roll before slicing. The filling needs time to set. I hope you enjoy this caramel pumpkin cake roll recipe! 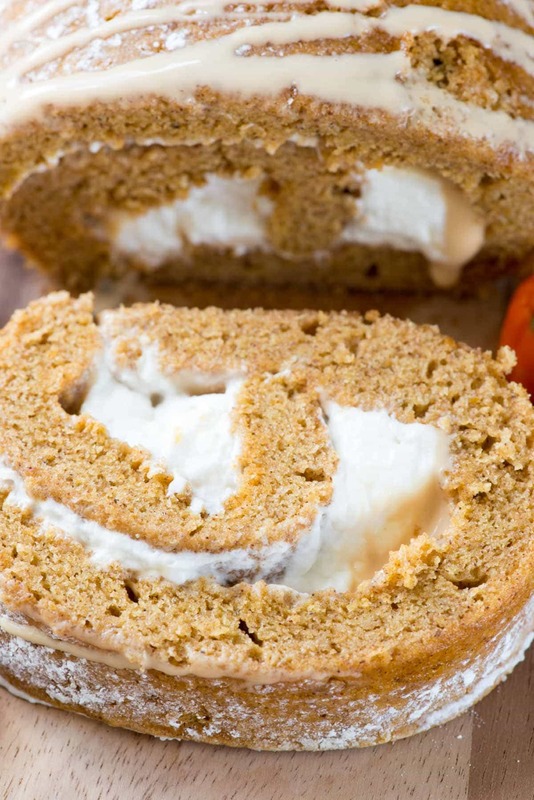 Caramel Pumpkin Cake Roll - an easy pumpkin roll filled with caramel ganache and cream cheese whipped cream. This is the BEST pumpkin roll recipe! Preheat oven to 375°F. Line a 10x15 jelly roll pan with foil and spray with nonstick cooking spray for easy removal. Make the caramel ganache: place caramels and heavy whipping cream in a medium microwave safe bowl. Heat on high power in 30 second increments, stirring between each, until melted and smooth. Chill until set, a few hours. While the caramel is chilling, make the cake and filling. Beat eggs at high speed for 4 minutes, or until the eggs are thick and dark yellow and foamy. Mix in sugar until combined. Add pumpkin, lemon juice, baking powder, spices, and salt, mix until combined, then slowly mix in the flour, scraping the sides of the bowl as needed. Place cake batter in prepared pan and speed into an even layer. Bake for 11-15 minutes or until it somewhat bounces back when you lightly press it (and the top of the cake doesn’t stick to your fingers). A toothpick will come out clean. While the cake is in the oven, lay out a clean kitchen towel and sprinkle it liberally with powdered sugar. Remove the hot cake from the oven and immediately flip it over (careful not to burn yourself) and remove the pan and foil. Roll up the cake using the towel. Let sit at room temperature to cool, about 2-3 hours. Make the filling: beat cream cheese until creamy, then mix in sugar until smooth. While the mixer is running, add the heavy whipping cream slowly and then the vanilla. Turn the mixer up and beat until the mixture has turned into whipped cream with stiff peaks. Finish the caramel by removing it from the refrigerator and beating it with a hand mixer until it’s spreadable. It will change in color and consistency. Assemble the cake: carefully unroll the cake from the towel. It may crack, but that’s okay, just be gentle. (Mine cracked but you couldn’t tell!) Spread a thin layer of caramel on the cake, then top with a hefty helping of the filling. Re-roll the cake, removing it from the towel as you go. (It may stick a little). Wrap the cake in plastic wrap and chill at least one hour before serving. You are a brave woman, openly tinkering with a MIL recipe. But she sounds like a pretty cool MIL, and she makes cake rolls, which makes her the best one ever. And you can’t go wrong adding caramel to pumpkin! This looks amazing!! You’re the cake roll queen! I love the story about Lorna and this family tradition…but that Mel doesn’t like pumpkin. Lol. Another gorgeous masterpiece and love the dual filling! Please do something with the cake roll book! As a cake roll virgin who is too chicken to try making one, a book like that would be a baking bible for me I will be trying this recipe next weekend though. Thanks for the tips. Seriously, how do you do it? You know, the thing. Where you leave me drooling every time I stop by! This cake roll looks TO DIE FOR! Wow, Lorna’s pumpkin cake rolls are great but this sounds like a wonderful change. And sooooo pretty! This looks amazing! 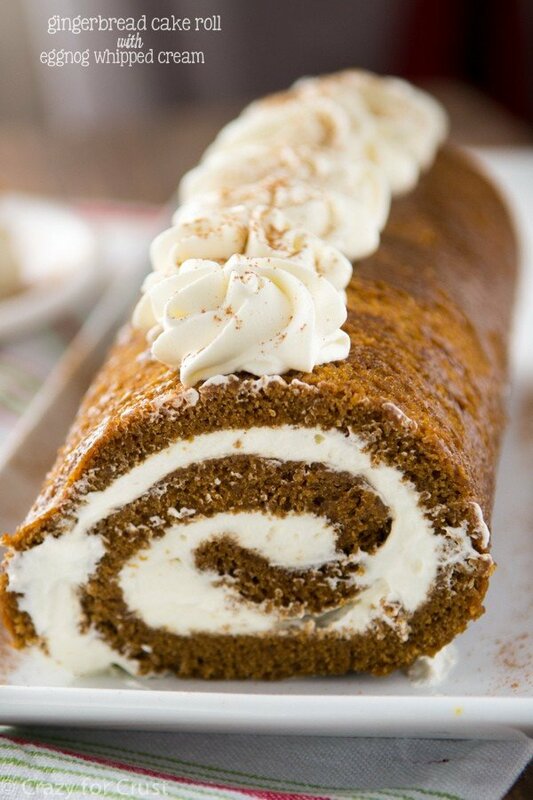 Pumpkin rolls are one of my favorite desserts! I like the caramel addition too. Pumpkin and caramel, yum, yum, yum! I would love to do your mother-in-laws trick for giving the cake rolls everyone loves them and the mini ones would be perfect to make for gift giving. Did she roll each of the thirds in individual towels with powdered sugar or did she roll the whole cake then cut into thirds before filling. Sounds genius to me also 🙂 . But of course I love the sound of your fillings so I will be using these to put in the middle of my cake rolls. I kinda have a passion for making cake rolls also. Love them and your recipes. Thank you so much for them all. I would love to do your mother-in-laws trick for giving the cake rolls everyone loves them and the mini ones would be perfect to make for gift giving. Did she roll each of the thirds in individual towels with powdered sugar or did she roll the whole cake then cut into thirds before filling. Sounds genius to me also 🙂 . But of course I love the sound of your fillings so I will be using these to put in the middle of my cake rolls. I kinda have a passion for making cake rolls also. Love them and your recipes. Thank you so much for them all. And be sure to do something with that cookbook it sounds amazing and would buy it for sure!! !